Carlos Alberto, Brazilian captain of Brazil's World Cup winning side of 1970, and scorer of perhaps the most memorable goal in football history has passed away. I have always been an admirer of Cesare Prandelli: as Fiorentina manager he made them play good football, and also as Italy manager, he created a much more see-worthy Italian side, playing passing and pressing football, than at any time in Italian football history. So it is with great happiness and expectations that I see him appointed as Valencia manager. That said, being Valencia manager is no easy task from a club whose fans and management have always been too demanding and too easily have fired managers who have gone to great success in other clubs. I certainly hope Cesare Prandelli will not be the same, and he has started positively, with defeat to Atletico Madrid, a victory over Sporting Gijon, and last Saturday a 2-3 defeat to mighty FC Barcelona, whom Prandelli's Valencia did not make so mighty. FC Barcelona had to win on a late penalty by Lionel Messi and some help from a hapless referee. But positively for Valencia it may look like good things ahead under Prandelli! Guiardiola again returned to Barcelona with another team: in 2015 he went there with Bayern Munich for the CL semifinal, just to be destroyed 3-0 on two goals by Lionel Messi and one by Neymar. Last night Messi and Neymar were as welcoming to their old manager, who now returned with Manchester City: Messi scored three and Neymar one goal to give Barcelona a comfortable 4-0 win over the English side. If anything, it shows Guardiola's near naivite to playing his old side, which arguably made him a great coach because he had no other than Lionel Messi. Since then he has managed strong teams, but is still to show that he can do great things in teams without the great little Argentine. One of Guardiola's weakest decisions was again exposed last night: Claudio Bravo. More than anyone he cost Machester City when, at the score 1-0, he mishandled the ball and had no other option than to make an illegal save outside the area, costing him a red card, and putting Willy Caballero on goal. Caballero did not have chances on Barcelona's subsequent three goals (even though he saved a penalty from Neymar, confirming his excellent qualities as a penalty-stopper) with Manchester City three men down. Guardiola preferred Claudio Bravo instead Joe Hart because he apparently had more technique, but again he costs goals exactly on his lack of technique, again proving that Hart is a far better goalkeeper! On top of it, FC Barcelona must have been smiling to themselves: they sold Bravo to Manchester City, knowing that the young Marc Ter Stegen is a far better goalkeeper, something he also proved last night with some excellent saves on Manchester City's attempts. Some credit must go to Manchester City: they did play a good match, and even down 1-0 one felt that they could have come back into the match. I am not a Real Madrid fan. 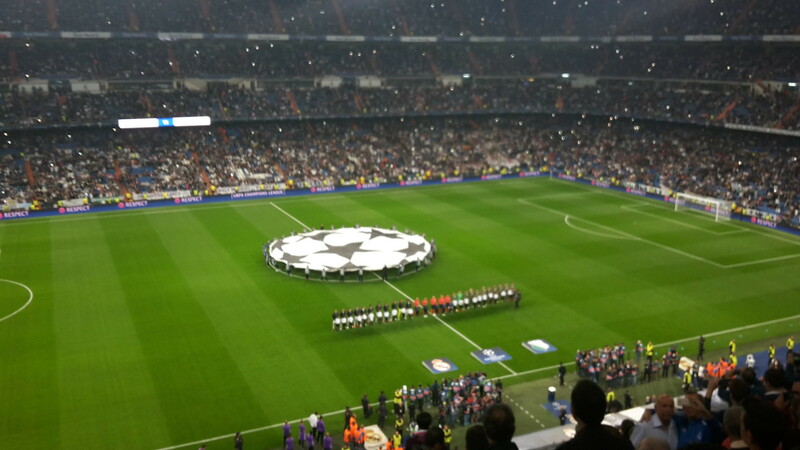 But as a football fan it is important to visit all the great football venues, so as I happened to be in the Spanish capital I went into watch the Champions League clash between Real Madrid and Legia Warsaw. It is indeed a place waded in history, proud and impossible to intimidate. The rowdy and loud Legia fans screamed like crazies, but nothing can intimidate experienced Real Madrid fans, who have seen everything, and who are really there to see THEIR own side play great football. In that sense Legia and their fans were just today's complementary extras. I have the greatest respect for Real Madrid fans, just as for Barcelona fans, and this visit confirmed it. Real Madrid fans were interested in seeing the team after some poor performances. Although they won 5-1, the performance was not outstanding against a quite poor Polish team. Without Luka Modric and Sergio Ramos the team looked shaky in defence, where they gave away a silly penalty, and Keylor Navas made some fine saves. Cristiano Ronaldo had a bad day (and perhaps should have been taken out earlier) while the fans were happy to see some of the lads from the "cantera" come in and score in the second half: Lucas Vazquez scored and excellent goal on a pass by Alvaro Morata, while Morata himself scored the last goal. Borussia Dortmund defeated Sporting Lisbon and are now leading the group, but it is clear that Borussia Dortmund and Real Madrid will be the two sides to progress to the knock-out stages. 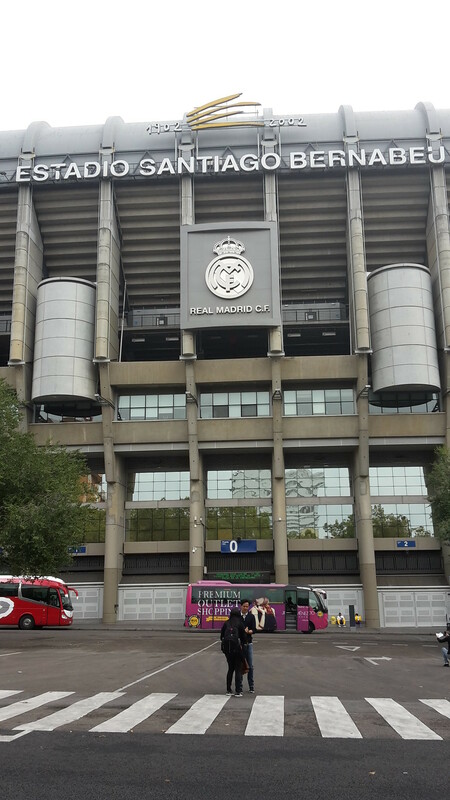 Interesting experience and I am now able to say that I have been at the legendary Santiago Bernabeu. 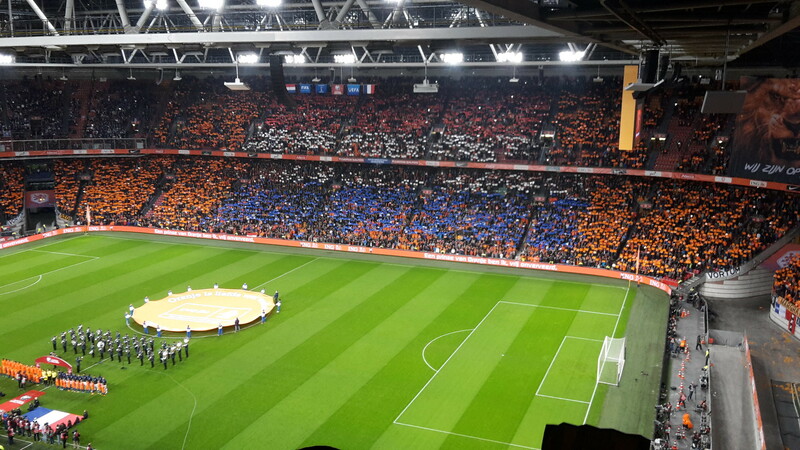 The best thing about visiting the Amsterdam Arena to watch the World Cup qualifier between the Netherlands and France were the always fantastic Orange fans. The same cannot be said for their home team, who losing 0-1 at home may be heading for another summer without participation in an international tournament. This may be like in the 1980s when the Dutch, after making it to the 1978 World Cup final did not qualify for the 1982 or 1986 World Cups or the 1984 Euro. We now had a Euro without the Dutch, and I frankly doubt that they can make it to Russia. A pity because their fans will be missed. In the meantime France, who should have been European champions, are looking strong. They still struggle in finding the right strikers to give them punch, but who cares when Paul Pogba is on fire and scores a great goal like he did against the Dutch!? I was in Warsaw and went to watch the 2018 World Cup qualifier between Poland and Denmark. Second match for both teams, where Denmark had opened with a 1-0 victory over Armenia and Poland had played 2-2 at home against Kasakhstan. The atmosphere was great at the beautiful stadium in Warsaw (where they played the 2012 Euro final) and Polish fans were really behind their team. And in the first half they swept Denmark aside, leading 2-0 on goals by the fantastic Robert Lewandowski. Early in the second half Lewandowski made it 3-0 before Denmark scored two silly goals as Poland drew back, and let the Danes into the match, it became unnecessarily tense for the home side. In the end Poland and Lewandowski prevailed to give them their first victory in the World Cup qualifiers, and us consolation hugs from Polish fans! That said, if these are supposed to be the two top teams in the group, they have to do much better. Denmark lacks fantasy amid a lot of possession and Poland lack a defense that will not make you nervous. In the meantime Montenegro and Romania have become the teams to be beaten in this group (they both won 5-0 against Armenia and Kasakhstan respectively, teams Denmark and Poland struggled against).